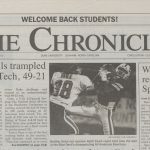 My colleague Sean wrote two weeks ago about the efforts a group of us in the library are making towards understanding the scholarly impacts of Duke Digital Collections. In this post, I plan to continue the discussion with details about the survey we are conducting as well as share some initial results. Surveying can be perilous work! After reviewing the analytics and Google Scholar data Sean wrote about, our working group realized we needed more information. 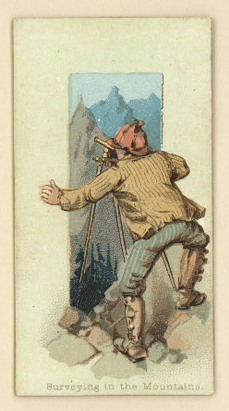 Our goal in this entire assessment process has been to pull together scholarly use data which will inform our digitization decisions, priorities, technological choices (features on the digital collections platform), and to help us gain an understanding of if and how we are meeting the needs of researcher communities. Analytics gave us clues, but we still didn’t some of the fundamental facts about our patrons. After a fervent discussion with many whiteboard notes, the group decided creating a survey would get us more of the data we were looking for. 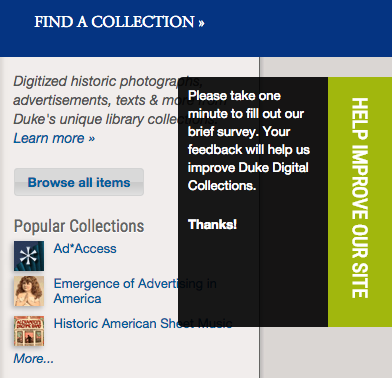 The resulting survey focuses on the elemental questions we have about our patrons: who are they, why are they visiting Duke Digital Collections, and what are they going to do with what they find here. Creating the survey itself was no small task, but after an almost endless process of writing, rewriting, and consultations with our assessment coordinator we settled on 6 questions (a truely miniature survey). We considered the first three questions (who, why, what) to be most important, and we intended the last three to provide us with additional information such as Duke affiliation and allow a space for general feedback. None of the questions were considered “required” so respondents could answer or skip whatever they wanted; we also included space for respondents to write-in further details especially when choosing the “other” option. Our survey in its completed form. The survey launched on April 30 and remains accessible by hovering over a “feedback” link on every single Digital Collection webpage. Event tracking analytics show that 0.29% of the patrons that hover over our feedback link click through to the survey. An even smaller number have actually submitted responses. This has worked out to 56 responses at an average rate of around 1 per day. Despite that low click through rate, we have been really pleased with the number of responses we have had so far. The response rate remains steady, and we have already learned a lot from even this small sample of visitor data. We are not advertising the survey or promoting it, because our target respondents are patrons who find us in the course of their research or general Internet browsing. Hovering over the help us box reveals expectations and instructions for survey participants. Before I start discussing our results, please note that what I’m sharing here is based on initial responses and my own observations. No one in digital collections has thoroughly reviewed or analyzed this data. Additionally, this information is drawn from responses submitted between April 30 – July 8, 2015. 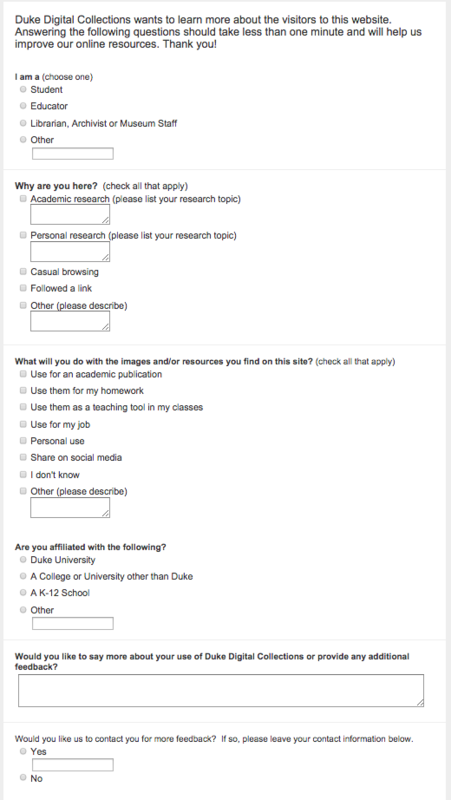 We plan to keep the survey online into the academic year to see if our responses change when classes are in session. With that disclaimer now behind us, let’s review results by question. Questions 1 and 4: Who are you? Since we are concerned with scholarly oriented use more than other types in this exercise, the first question is intended to sort respondents primarily by academic status. In question 4, respondents are given the chance to further categorized their academic affiliation. Of the respondents who categorized themselves as “other” in question 1, 11 clarified their otherness by writing their identities in the space provided. Of this 11, 4 associated themselves with music oriented professions or hobbies, and 2 with fine arts (photographer and filmmaker). The remaining 5 could not be grouped easily into categories. As a follow up later in the survey, question 4 asks respondents to categorize their academic affiliation (if they had one). The results showed that 3 respondents are affiliated with Duke, 12 with other colleges or universities and 9 with a K-12 school. Of the write-in responses, 3 listed names of universities abroad, and 1 listed a school whose level has not been identified. Question 2: Why are you here? We can tell from our analytics how people get to us (if they were referred to us via a link or sought us out directly), but this information does not address why visitors come to the site. Enter question 2. The survey asks that those who select academic research, personal research, and other to write-in their research topic or purpose. Academic research topics submitted so far primarily revolve around various historical research topics. Personal research topics reflect a high interest in music (specific songs or types of music), advertising, and other various personal projects. It is interesting to note that local history related topics have been submitted under all three categories (academic, personal and other). Additionally, non-academic researchers seem to be more willing to share sharing their specific topics; 19 of 24 respondents listed their topics as compared to 7 out of 15 academic researchers. Question 3: What will you do with the images and/or resources you find on this site? To me, this question has the potential to provide some of the most illuminating information from our patrons. Knowing how they use the material helps us determine how to enhance access to the digitized objects and what kinds of technology we should be investing in. This can also shed light on our digitization process itself. For example, maybe the full text version of an item will provide more benefit to more researchers than an illustrated or hand-written version of the same item (of course we would prefer to offer both, but I think you see where I am going with this). In designing this question, the group decided it would be valuable to offer options for the those who share items due to their visual or subject appeal (for example, the Pinterest user), the publication minded researcher, and a range of patron types in between. The 10 “other” respondents all entered subsequent details; they planned to share items with friends and family (in some way other than on social media), they also wanted to use the items they found as a reference, or were working on an academic pursuit that in their mind didn’t fit the listed categories. As I said above, these survey results are cursory as we plan to leave the survey up for several more months. But so far the data reveals that Duke Digital collections serves a wide audience of academic and non-academic users for a range of purposes. For example, one respondent uses the outdoor advertising collections to get a glimpse of how their community has changed over time. Another is concerned with US History in the 1930s, and another is focused on music from the 1900s. 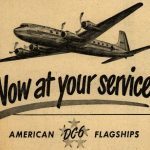 The next phase of the the assessment group’s activities is to meet with researchers and instructors in person and talk with them about their experiences using digital collections (not just Duke’s) for scholarly research or instruction. We have also been collecting examples of instructors who have used digital collections in their classes. We plan to create a webpage with these examples with the goal of encouraging other instructors to do the same. The goal of both of these efforts is to increase academic use of the digital collections (whether that be at the K-12 or collegiate level). Just like this survey team, we stand at the ready, waiting for our chance to analyze and react to our data! Of course, another next step is to keep collecting this survey data and analyze it further. All in all, it has been truly exciting to see the results thus far. As we study the data in more depth this Fall, we plan to work with the Duke University Library Digital Collections Advisory Team to implement any new technical or policy oriented decisions based on our conclusions. Our minds are already spinning with the possibilities. We try to keep our posts pretty focussed on the important work at hand here at Bitstreams central, but sometimes even we get distracted (speaking of, did you know that you can listen to the Go-Gos for hours and hours on Spotify?). With most of our colleagues in the library leaving for or returning from vacation, it can be difficult to think about anything but exotic locations and what to do with all the time we are not spending in meetings. 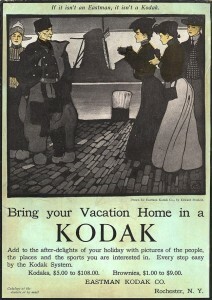 So this week, dear reader, we give you a few snapshots of vacation adventures told through Duke Digital Collections. Artist’s rendering of librarians at the beach. Many of Duke’s librarians (myself included) head directly East for a few days of R/R at the one of many beautiful North Carolina beaches. Who can blame them? It seems like everyone loves the beach including William Gedney, Deena Stryker, Paul Kwilecki and even Sydney Gamble. Lucky for North Carolina, the beach is only a short trip away, but of course there are essentials that you must not forget even on such a short journey. Of course many colleagues have ventured even farther afield to West Virginia, Minnesota, Oregon, Maine and even Africa!! Wherever our colleagues are, we hope they are enjoying some well deserved time-off. For those of us who have already had our time away or are looking forward to next time, we will just have to live vicariously through our colleagues’ and our collections’ adventures. Part of my job is to track our Duke Digital Collections google analytics data. As a part of this work, I like to keep tabs on the most popular digital collections items each month. There is generally some variation among the most popular items from month to month. For example in May, a post on the New Yorker blog pointed to some motherhood oriented ads and our traffic to these items spiked as a result. Be-Ro Home Recipes, our most popular item. However there is one item that persists as one of our most popular items: the Be-Ro Home Recipes: Scones, Cakes, Pastry, Puddings. Looking back at analytics since 2010 this is the most popular item by about 2000 hits (the book has seen 18,447 pageviews since Jan 1 2010). In the six months that I’ve been studying our digital collections analytics I consistently wonder, why this item? no really, why? Sure all the recipes call for lard, but that cannot be the only reason. 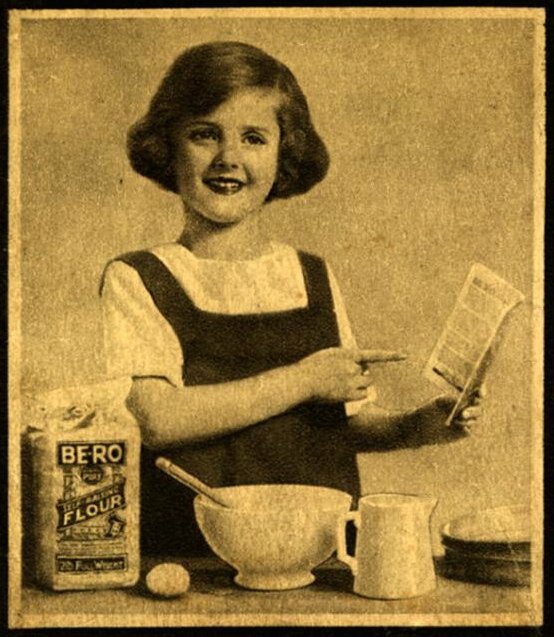 “Researching” the cookbook (conducting a few google searches) shows that the Be-Ro company was established in 1875 by the creator of the worlds first self rising flour. Home Recipes was originally published as a pamphlet to promote use of the flour as early as the 1880s. Our version includes over 50 recipes, was published in the 1920s, and is the 13th edition of the cookbook. Duke’s Home Recipes claims that baking at home with Be-Ro is more economical and inspires the a better home, thanks to the woman of the house’s baking: “In ninety-nine cases out of a hundred she has a happy home, because good cooking means good food and good food means good health” (from page 2). This cookbook has a storied history to be sure, but that still doesn’t explain why our version is so popular. I kept searching, and found that there is a fervent and passionate following for the Be-Ro Cookbook. Several UK cooking blog posts swoon over the book, saying they grew up with the recipes and first learned to bake from it. The community aspect of the cookbook jives with our traffic as most of the users of the item on our website come from the UK. Another factor driving traffic to our site is that Duke Digital Collections’ version of the cookbook tends to be the 4th hit on Google, when you search for “Be-Ro Cookbook”. This investigation left me with a better understanding of why this cookbook is so popular, but I’m still surprised and amused that among all the significant holdings we have digitized and available online, this cookbook is consistently the most visited. Are there conclusions we can take away from this? We are not going to start only digitizing cookbooks as a result of this knowledge, I can promise you that. However analytics shows us that in addition to the more traditionally significant items online, items like this cookbook can tap into and find a strong and consistent audience. And that is data we can use to build better and more resonant digital collections. Your Duke Digital Collections team, as well as most of the rest of the university have been locked down at home for the past two days due to snow, ice and the dreaded “wintry mix”. 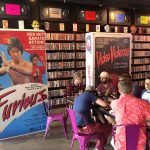 If you, like us are looking for ways to entertain yourself and celebrate Valentine’s Day, you are in luck! Among the treasures in the Emergence of Advertising digital collection, we have a cookbook specially designed to help you plan and execute meals for all holiday occasions from children’s parties to, you guessed it, Valentines Day! Check out some of the recipes below. Nothing says, be my valentine like Chicken a la King and Drip Coffee! !